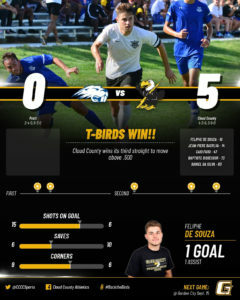 CONCORDIA — The Cloud County Community College men’s soccer team went back above .500 on the season and stayed undefeated in the KJCCC West on Wednesday, rolling to a 5-0 home win over Pratt Community College. Cloud County (4-3 overall, 3-0 KJCCC), the two-time defending KJCCC West champions, flexed its muscle Wednesday afternoon against the visiting Beavers (2-4 overall, 0-3 KJCCC) as the T-Birds finished with a 24-11 shot advantage. The T-Birds cashed in two of those shots in the first half on goals from sophomore Feliphe Pasetto de Souza — his first of the season — at the 9:13 mark of the first half. Freshman forward Jean-Piere Dasylva added to what has been a tremendous start to his collegiate career with his team-leading fifth goal of the year four minutes later to make it a 2-0 advantage. Cloud County would add three more goals in the second half, the first coming at 46:29 by freshman Caio Faro, who buried a shot after receiving a perfect feed off a free kick from sophomore goalkeeper Charles Albuquerque for his first career assist. Albuquerque, the defending KJCCC and NJCAAA Goalkeeper of the Week, also nailed down his second shutout of the season, stopping all six shots on goal he faced. Sophomore midfielder Baptiste Bissessur, on an assist from de Souza, and freshman defenseman Daniel da Silva rounded out Cloud County’s scoring with goals at 72:41 and 82:50, respectively. The goal from Daniel da Silva marked his first collegiate points. Cloud County will look to ride the momentum from its current three-game winning streak into a road matchup against Garden City Community College this Saturday. Kickoff is currently scheduled for 7 p.m.